Gabriel Buntebart was one of numerous German piano makers who settled in London during the mid-18th century. From 1768 to 1778 he partnered with the famous Johannes Zumpe, then struck out on his own and became quite successful, making unpretentious instruments like this one as well as more ornate models. Two of his instruments (one in the collection of Pooya Radbon, the other in the Cobbe collection) were signed on the soundboard by Johann Christian Bach, who lived and worked in London for many years. 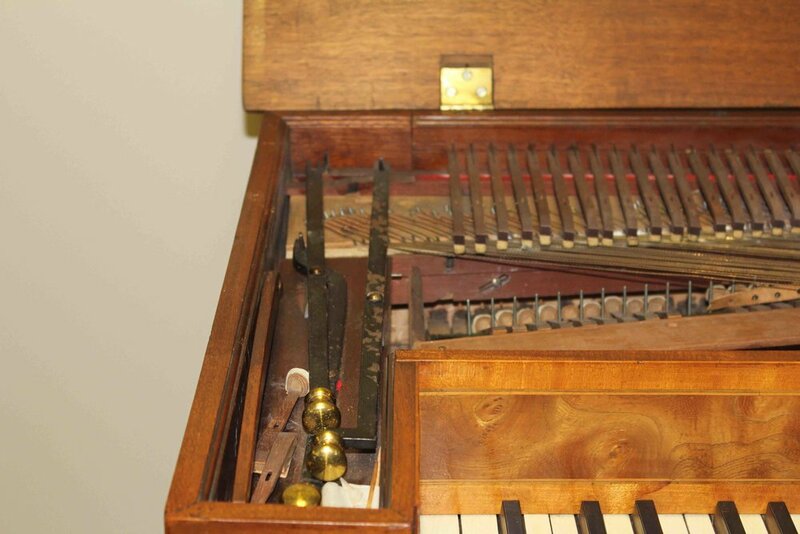 Zumpe popularized the square piano in England by making large numbers of standardized instruments with a simple action lacking back checks and escapement mechanisms. Instead, a fixed jack on the key (a stiff metal rod topped with leather-covered wood) propels the hammer to the string. This design, often called the “English single action,” was widely copied for about 40 years, especially by makers in England and France, and helped lead to the piano displacing the spinet in the home. In his Art of Tuning (1836), Montal wrote about such instruments as among the most common a piano tuner would encounter. Montal also included instructions for their tuning and repair in his 1865 edition, since apparently many of them were still being used even then. For photos of some other Buntebarts: 1770 University of Edinburgh, 1773 Rijksmuseum, Amsterdam, 1774 Cité de la Musique, Paris, 1776 Museum de la Music, Barcelona, 1790 Musiekinstumentenmuseum, Brussels. The year of manufacture appears on the nameplate, a custom that disappeared in the early 1800s. This is a frontal flap on the treble side of the lid. If the instrument was played with the lid down, which was normal during the period, raising this flap would increase the volume a little. Slamming the flap closed could imitate gunfire in “battle” pieces. To the left of the keyboard, three iron levers with brass knobs operate the bass and treble dampers (separately) and a buffstop. The dampers are usually either raised or lowered during the entire course of a piece or a movement. Springs made of whale baleen push the dampers down against the strings. The buff stop moves a thin,leather-covered wooden batten upward to touch the strings, creating a muted, pizzicato effect. 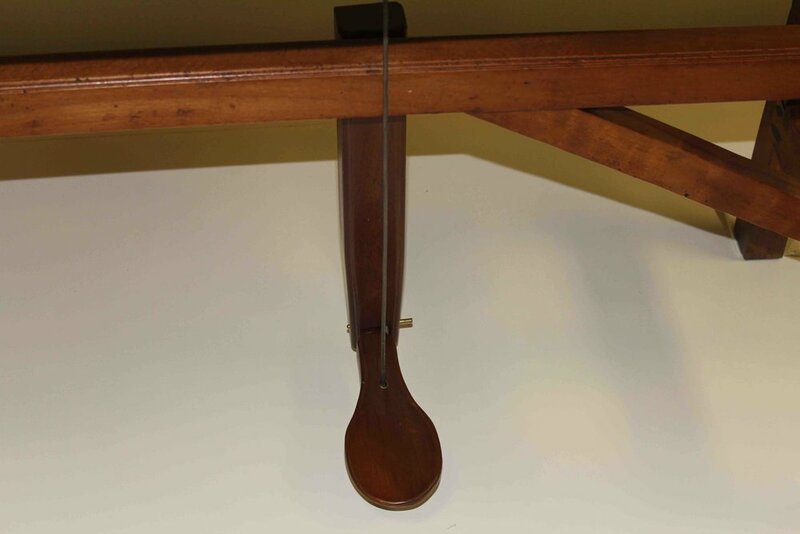 The slanted slot in the batten above the lowest hammers directs the batten towards and away from the strings when the lever shifts it from side to side. 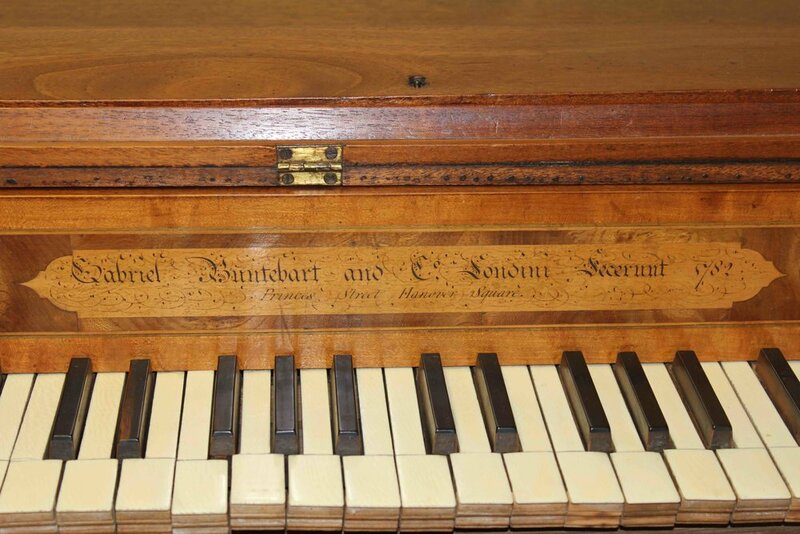 The case and stand of this instrument are quite plain, as this was one of Buntebart's more basic, inexpensive models, which helped to spread the piano and its use to the middle classes. A view of the flap lifting mechanism, a vertical pusher covered with leather. The range of the keyboard is almost five octaves, G1 to F6, lacking a G# key. A view of the tuning pins and bridge. The pins are arranged in two double rows, with adjacent notes alternating right and left. This made it challenging to find the correct pin while tuning. Some form of counting pins was necessary when setting the temperament, as described in Claude Montal's Art of Tuning. The hammer and damper levers are hinged to their rails using parchment or thin leather. The levers each ride on a pin to help center them on the strings. The hammers are covered with multiple layers of leather. The lower, darker layers are likely original, while the lighter-colored layer was added later to produce a mellower tone as the original leather hardened with use and time. The Buntebart has one pedal, which operates a small swell, seen in the next photo. Note that the bass string windings are somewhat open, and extend across the bridge. The bridge is undercut at the bass end, to allow the small soundboard to vibrate more freely. From Claude Montal's The Art of Tuning, this plate illustrates the type of action used by Zumpe, Buntebart, and many others.